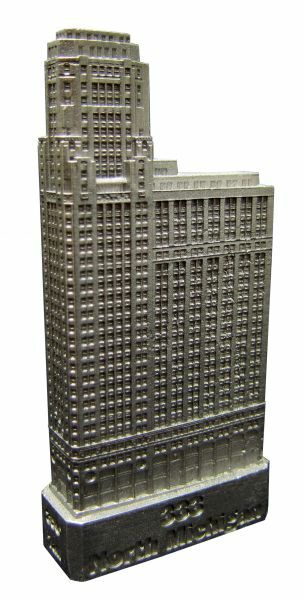 The 333 North Michigan Building is located at 333 N. Michigan Avenue in Chicago, Illinois and was completed in 1928. This building was designed by Holabird & Root Architects and stands 396 feet tall with 34 floors. 333's extreme setbacks on its upper floors are due to a zoning law passed in 1923. This pewter replica stands 3" tall at 1" = 150 feet. This model is finished in new pewter.